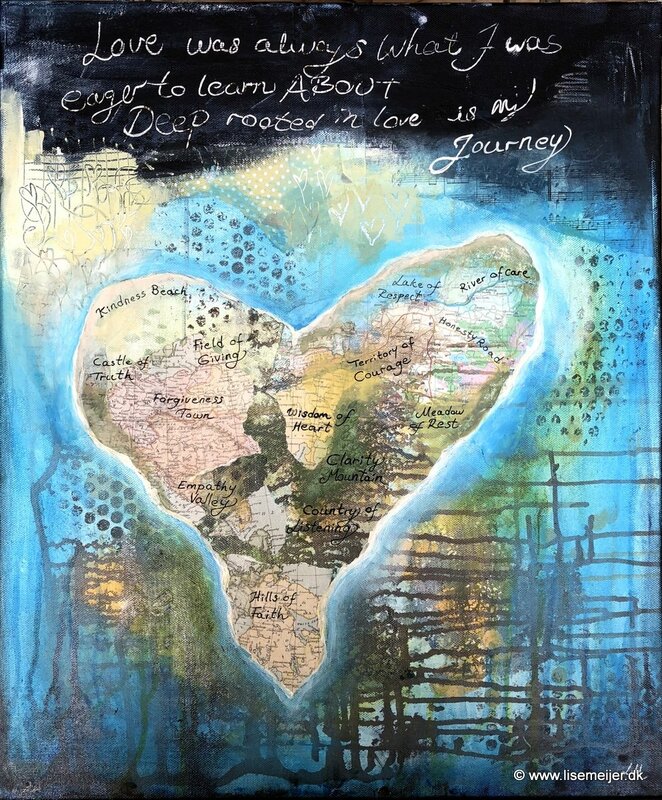 Journey of love: Let´s go rafting on River of Care, and then continue to look deep into Lake of Respect. Later we could take a turn along Honesty Road which will lead us straight to Territory of Courage. Then we may pass through Field of Giving, and when we arrive at Kindness beach we will take a long and needed rest and perhaps a bath to warm our souls and gain strength. Refreshed, we will visit Castle of Truth, a tough but also eye opening place to be. After that, let´s go to Forgiveness Town and stay there as long as needed to make our hearts softer and lighter. From there we will walk through Empathy Valley and climb into Hills of Faith. Our journey may then lead us through Country of Listening, an important place to know for Love Travellers, and over to Clarity Mountain. And there, we can already spot our final destination: Wisdom of Heart.